Home is where the heart is, and the heart of your business is your facility. You want to take care of your business’ home, right? One way to ensure your facility is taken care of is through facility management software and understanding available facility management software features and requirements. Facility management (FM) software is a subcategory of computerized maintenance management systems (CMMS) that focuses on the repair and maintenance of an organization’s facility/facilities rather than its assets. The goal is to help you manage your buildings, spaces and occupants more efficiently. What do you need from an FM system? Every business is different, and FM platforms offer you a range of options from a comprehensive list of everything that they can do. You won’t need every feature offered, so we’ve compiled a facility management checklist to help you identify your requirements and get organized in your search for facilities management software. Maintenance management is very important in a company. In fact, it partially determines the long-term success of the company because poorly maintained resources can bring operations to a halt, and could cause the company to lose money. Maintenance management is all about maintaining the resources of the company so that production proceeds effectively and that no money is wasted on inefficiency. There are many software programs that assist with this process, and there are a few objectives that a maintenance manager should seek to accomplish. These objectives are to control costs, to schedule work properly and efficiently and to ensure that the company complies with all regulations. 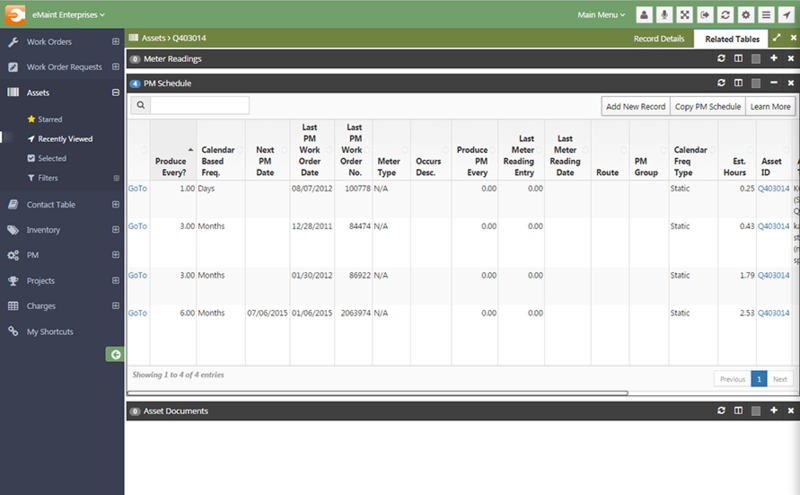 Maintenance management tracks and plans all the maintenance on your assets from scheduling to work orders. Some maintenance management modules will even offer assistance in ensuring regulatory compliance and calculating costs. Preventive maintenance is maintenance that is regularly performed on a piece of equipment to lessen the likelihood of it failing. It is performed while the equipment is still working so that it does not break down unexpectedly. Preventive maintenance is more complex to coordinate than run-to-failure maintenance because the maintenance schedule must be planned. Preventive maintenance is all well and good, but if you have to manually track that preventive work, it’s not very efficient and takes too much of your valuable time. Scheduled PM tracking automates scheduling, email alerts and other tracking features to keep your preventive maintenance on task. Some have user-friendly interface features like drag-and-drop capabilities, or record-keeping features for uploading picture or file attachments and audit trails. Your assets are the lifeblood of your business, so maintaining them is crucial. Asset and Equipment Management covers all aspects of any type of equipment including vehicles, mobiles, software, equipment, office assets, service records, schedules for maintenance and equipment non-conformance or faults. It’s important to be able to track all aspects of equipment maintenance, not just the scheduled but also the unexpected maintenance requirements. Service records, schedules for maintenance, equipment faults and equipment non-conformance can be recorded and their progress tracked. Calibration schedules can be set and Calibration reports can also be attached. Everything relating to a piece of equipment can be kept together for ease of location within the one module. Repair orders can be raised and tracked. An inventory of parts can be tracked and usage recorded. Any equipment that is Sublet or shifted to another location is recorded. FM software offers a variety of features to track and manage the maintenance, performance, repair and importance of assets. For all facility inventories, managers must carefully balance available space, inventory carrying costs, ordering lead time, and projected inventory needs. Inventory management involves setting up systems and processes that identify what items should be kept in inventory, how many of those items should be in inventory, when to replenish those items, and when and how those items are being used within the facility. Regardless of what makes up your inventory, you need to keep track of it. FM software can help! Some operations need to track, manage, record and log materials or other inventory. Some need features that can function over multiple locations. Most will probably find automated alerts and audit trail features useful. Some CMMS software includes enough inventory management for your operation, but other users need a designated software just for their facilities. Work orders get things done smoothly and properly. The work order management process begins when the work order is created. This can be accomplished through a number of channels, such as a mobile device or the system itself. With EAM systems some types of work orders, such as preventative maintenance and fixed tasks, are triggered automatically once they have been configured according to their specific parameters. The order management process is then controlled by the workflow, which is based on the type of work to be performed. For example, by using workflow options, additions such as planning, actions taken, and other information is populated for later records. Most facilities management software provide options for creating, evaluating, automating and prioritizing work orders. They come with a range of dashboards and user portal options to choose from for interacting with your interface. Space management is the management of spaces – control and supervision of the physical spaces a business or organization occupies. This could be a single floor, multiple floors within a building, or multiple floors within multiple buildings. Space management is simple in concept yet far more complicated in practice. If your asset is your space, you need ways to efficiently manage it. Depending on the type of operation, your needs for this category will vary greatly. Do you rent out apartments? Space utilization dashboards, availability management and room scheduling could be for you. Do you have mobile worksites or locations to monitor? You may want to look into GPS interface. Know your specific needs before you search for any of the facility management software features in this category. Movement Management or Asset Tracking software allows companies to track what assets it owns, where each is located, who has it, when it was checked out, when it is due for return, when it is scheduled for maintenance and the cost and depreciation of each asset. If your assets are on the move, your software needs to be able to follow. Users can track and schedule movements of equipment and staff and get automated notifications for scheduled movements from a centralized dashboard. This includes having mobile access via smartphones or tablets — not being chained to a desk is a game-changer. Lease administration involves receiving rents from facilities they own and paying rent for the facilities they lease. If your business leases something, you need to be on top of managing it. Lease tracking and alerts are fairly basic needs, but there are plenty of additional features you can expect from a facilities management software. Set-it-and-forget-it automated lease payment options are a huge plus for your tenants, and configurable lease management makes fluctuating rental charges easy to handle. The businesses and individuals that provide goods and services to an organization are considered its vendors. A company could work with a few, dozens, or even hundreds of different vendors, all with different contract terms, pay rates, and points of contact that must be managed through a vendor manager. The term vendor management is used when describing the activities included in researching and sourcing vendors, obtaining quotes with pricing, capabilities, turnaround times, and quality of work, negotiating contracts, managing relationships, assigning jobs, evaluating performance, and ensuring payments are made. It requires a lot of skills, resources, and time. Users can manage the vendors they utilize in the same software that manages the facility itself. From proposal submission and sourcing to tracking your interactions with those vendors, don’t feel like you have to purchase additional software. Or — we shudder at the thought — use pen and paper tracking methods for this functionality. BI reporting primarily enables in receiving output or results from a BI software/ solution. Typically, BI reporting is a preconfigured function /feature /component within a BI software/ solution. Based on the parameters set, BI reporting is generally an automated process that captures and report on analyzed data. These reports can be in form of statistical data, visual charts and/or standard textual content. Users can get the nitty-gritty details of your business with a variety of reporting, analytics, and other BI functions. Different software offers different types of analytics tools for predictive, descriptive or prescriptive analysis. Most give you options to configure customized dashboards for data visualization so you can interpret the data you’ve collected. Users can also set up automated scheduling so you’ll always have reports when you need them. Now that you know what to look for in light of our list of facilities management software requirements, check out our comparison matrix to view top FM software solutions side-by-side to select the right solution for your business.